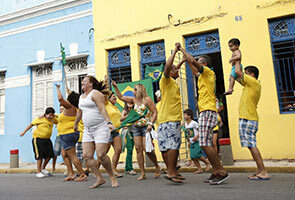 AFTER a 48-hour break from top class on-field football action from multiple venues all over Brazil in the first round of the current World Cup, the action continued on Saturday (June 28). That we have come this far perhaps is quite surprising to some considering the disruption promised by protestors. Brazil performing so well on the pitch perhaps was the best retardant that doused all the fire. Any party pooping protestor might well be pelted with rotten eggs should they disrupt the train of celebrations that has come with each Brazil victory. The latest was the first match that kicked off the Round of 16; where every game is a final. Lose and wave goodbye! Having topped Group A at the completion of the preliminary matches, Brazil was given the easier task of being pitted against the Runner-up of Group B; Chile. Otherwise it would have had to face Holland if the script had been different. As things panned out, Group A runner-up Mexico will have the unenviable task of facing up the Orange horde who I have always felt should already by now boasting of having two World Cup trophies to its name (but that’s for debate on a different day.) Brazil go into the quarter finals with statistics on its side. It has not lost a competitive match at home since 1975. But then Chile was not going to lie down and capitulate or provide easy passage when the two met in Belo Horizonte. Things went according to script initially. Brazil went ahead as early as the 18 minute through David Luiz who prodded home after Thiago Silva headed on a Neymar corner. Some 15 minutes later Chile dared to register a riposte – and actually scored one to level the score at 1 – 1! Their key attacker Alexis Sanchez found a way round Brazil stalwart Cesar to score the equalizer. In the second half there was a little bit of controversy when Hulk thought he had scored Brazil’s second but the referee ruled otherwise. Before the game, Chile made great issue of the choice of English whistler Howard Webb to referee the game. They voiced their fear that Webb was prone to buckle under pressure and bound to favour the home team when it comes to hairline decisions. Nothing to worry really; for the Chileans that is! For when the time came, Webb made some decisive rulings against the Brazilians. Despite having the lions’ share of the possession, it was Chile that could have nicked it right at the end. Chile substitute Pinella hit the bar in the 119th min. The game, extra time and all; lasted 120 min. The whole of Chile rue that miss, as the stalemate had to be settled through penalties. When the crunch came, it was the Chileans who blinked. Neymar performed creditably as he did not buckle under pressure, during the penalty shootout. The manner in which he takes penalties has been a major talking point. He has his trademark stumbling run – a jig to the left, a dart to the front, a momentary pause before a thunderous thump as the ball whizzes past and hits the back of the net. It may be unprofessional when you are the opposing goalkeeper but try telling that to the Brazilians! The other South American tussle attracted plenty of attention too. Not high-riding Colombia but everyone’s favourite bogey – Uruguay. However much we wish to give Uruguay the benefit of the doubt, their case is not helped by the apparent blind nationalism in their defence of Luiz Suarez. Perhaps FIFA should employ a dentist to take an imprint of Suarez’s molar mark and use that as incontrovertible evidence. When the crunch came, a Suarez-less Uruguay succumbed to Colombia – more precisely to the powerful boot of James Rodriguez. The spare Colombian forward who plays for unglamorous Monaco in the French Ligue 1 became the object of focus soon after news of injury ruled out superstar Radamel Falcao from making it into the squad. Suarez’s banishment is just as well. What would the repercussions be one wonders, if Uruguay had won – and kept on winning? Even the most lazy amongst lawyers can sense an opportunity to raise a stink. With the spotlight trained on him, the young Rodriguez took his chance on the footballing stage – with both feet – as he has now gone on to score in all four matches he has played so far. In fact he tops the goals tally with five in this tournament. What of Colombia’s next match? Bring on Brazil! They no doubt will fancy their chances.